Hello! A few weeks ago I asked for help finding a larger capacity cup to my small LadyCup. 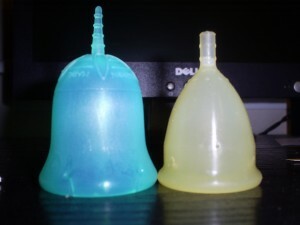 One of the cups suggested was the Sckoon, so after doing research I ordered the large size from Amazon.com. It came today and I was so excited to try it out and compare it to my LadyCup. I was a little nervous because it is quite a bit bigger than my small cup, but at first touch I realized it was so soft! The firmness around the rim is a lot less than Ladycup, and like some others mentioned, the stem is VERY stretchy. Well, I am doing a dry run right now. It took a bit to get it in. Since it is so soft I couldn't push it up while folded in the same way I was used to. It started going inside out when I did that. Whoops. Finally after 4 tries it went up and popped open! YAY! I can't even tell it's there! 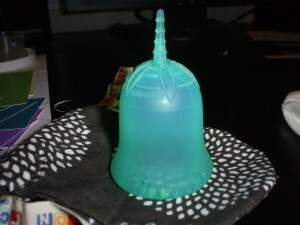 With my Ladycup I could always feel it if I did kegels or sat in certain positions, but I seriously think I would forget that the Sckoon is there. I'm actually looking forward to my period so that I can try it out! Sorry, I fixed the photo problem. Oh good! Now I see them ~ thanks for posting.